The sun is crossing the celestial equator on Wednesday, ushering in the spring season with 12 hours of daylight and 12 hours of darkness. The first day of spring has been celebrated by cultures for some 8,000 years. Your celebration doesn’t have to be filled with wine, like the tribute to Dionysus held in Ancient Greece, or be spent cleaning your family’s grave sites like on Shunbun no Hi in Japan. 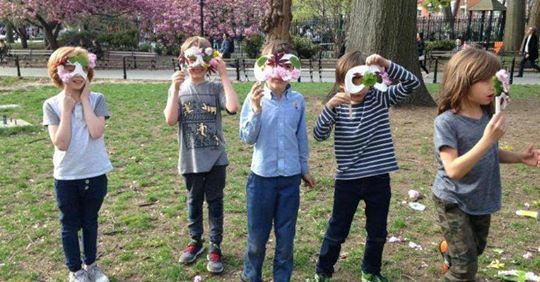 We’ve got plenty of fun ways to celebrate the Spring Equinox with your children this Wednesday. Celebrate new life by getting outdoors. Central Park Volunteer Drive (9:00 – 11:00 am) – Teach your kids to be great stewards of the Earth. Birding Basics (10:00 – 11:30 am) – Look for 270 migratory species on a guided woodland tour. Fishing at the Harlem Meer (11:00 am – 4:00 pm) – Free! All poles, bait, and instruction provided. Strawberry Fields Stroll (2:00 – 3:30 pm) – Family dogs are welcome on this free guided tour. The last spring frost for the New York City zone is forecast for April 5th, so it’s still risky to plant anything outdoors. Yet, it’s the perfect time to start your seeds indoors. Sunflowers in a Styrofoam cup are a fun project for kids who’ll love to see how large their plants grow over the summer. Place the seeds an inch down in a Styrofoam cup filled with loose commercial potting compost. Be sure to punch a hole in the bottom of the cup for drainage. Don’t over water, but see that the seedlings remain moist to the touch. Set the cup in a warm, ventilated place. You can place them near a window that receives a lot of sunlight, but a fluorescent light will work just as well. Hedge your bets by planting more than one cup, just in case. You can also take the kids to your local florist to hand-pick your favorite flowers for a fresh spring bouquet to brighten up your home while you wait. Teach your child about the changing seasons, enjoy the “mess” of finger-paint, and create a great keepsake for the home or gift for loved ones with this craft project. Paint a mini canvas light green for spring with dots of light pink, dark pink, light green, and dark green fingerprint leaves for the spring. If you’re feeling ambitious, you can do the other seasons now as well. If your kids are as young as 2 or 3, it’s best to work on this project for no more than 20 minutes at a time, over a five-day period.